In a democracy, every citizen or institution can exercise their fundamental rights of freedom of speech and expression in a non violent manner. Citizens may feel disgruntled due to governmental policies, administrative issues, basic infrastructure requirements, social requirements etc. The common methodology adopted by individuals or group of people, association of people is to announce STRIKE, whereby they try and highlight the unfair or unjust issue that has left them aggrieved. Transporters bodies have called for a nationwide strike with a charter of demands. STRIKES paralyse a growing economy like INDIA. This doesn’t augur well for India to reach its targeted GDP growth. 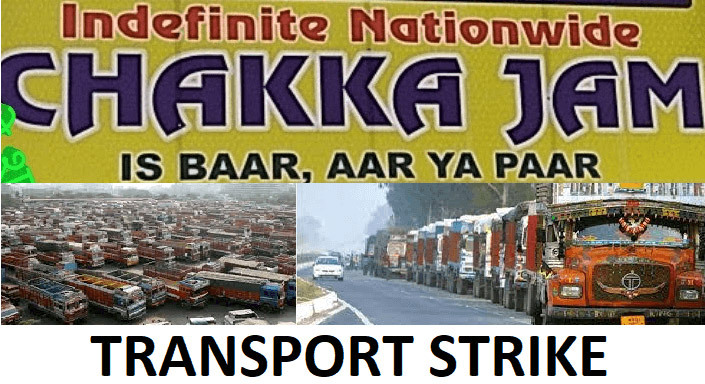 Priority should be given to safeguard life and goods while planning out logistics: It is very important to have reliable & intelligent vendors to cater to your transportation needs during a national transport strikes, as the requirement of goods at some facility or point of consumption would be acutely needed to ensure minimal downtime. Ply on routes with least hassles: Route planning is very important to ensure the cargo reaches safely. Stay away from toll booths, major highways, ports & more frequented roads. Stay away from notorious routes. Cautious & Reliable Driver: If the driver sees or senses any trouble ahead, it is wise for him to park the truck on the side of the road.. Strikers will usually leave them alone. A driver should also be able to tactfully handle these situations to ensure the truck, cargo & his safety are not jeopardized. A reliable driver is always worth the extra freight. Don’t keep a deadline for vehicle placement & delivery: At these times, it is safer to keep your cargo within your premises rather in transit. If transit is utmost required, give the transporter & driver leeway to act according to the current situation. It is wise not to pressure them to reach within a specific time. Wee hour driving: Driving after sun down & before 10am is preferable. Parking vehicles: It is wise to park vehicles at parking locations which are under lock & key and where safety can be assured. Convoy: Safety in numbers is your best bet. Transporters should ensure all their trucks move together during such instances, making it difficult for trouble makers to single out a particular vehicle. We sincerely hope your transportation is safe and secure!